Of all of history’s enemies, e.g., fire, storms, erosion, pollution, or growth; the biggest enemy of all is Time. As Time passes we are bound to lose track of what makes up our history… people, events, structures, records, stories, etc. This blog proposes to share topics of interest that were not available at the time of publishing our book, "Bayou Pigeon, LA - Spirit of the Atchafalaya." 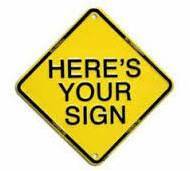 This Blog posting is about SIGNS…. 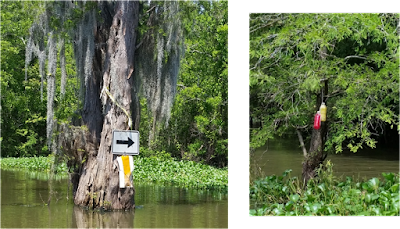 in the Atchafalaya Basin/ Floodway . 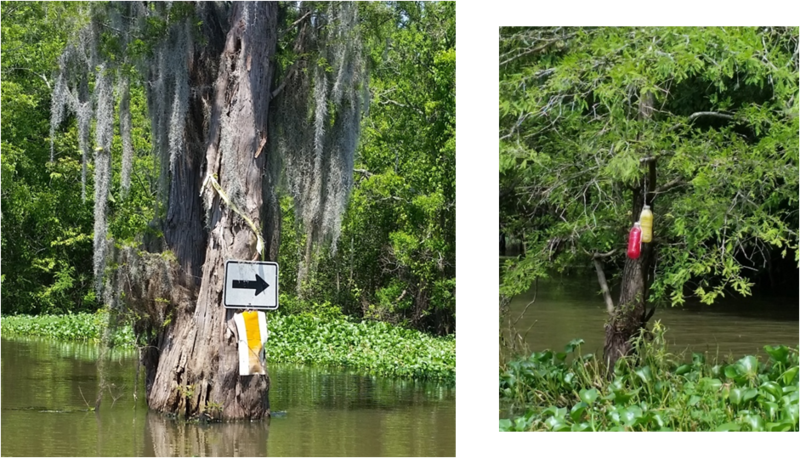 With that said that said I do realize there are many legitimate reasons for signs and some are absolutely necessary ie., ‘Warning Signs ‘calling attention to an unexpected waterway condition / obstruction. In some cases signs, done skillfully have a great potential in contributing to the sense of importance / history about a place, ie., historical markers. 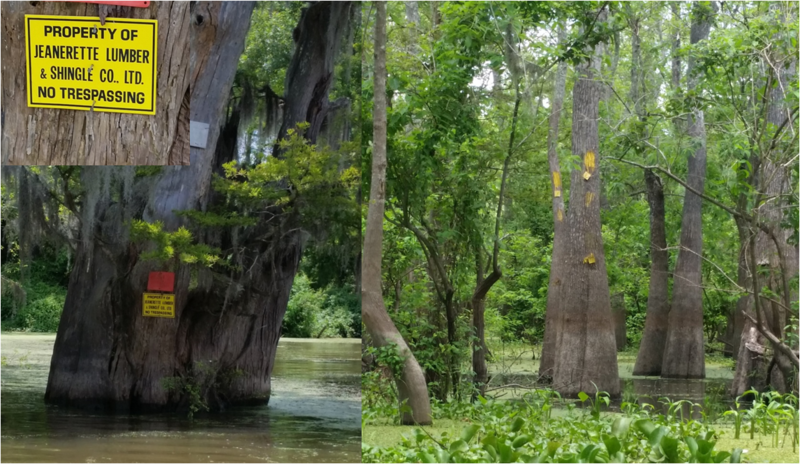 The stimulus for this blog post… is that I have been noticing a lot of signs showing up in the Bayou Pigeon / Grand / Lake Vector of the Atchafalaya Basin these days. 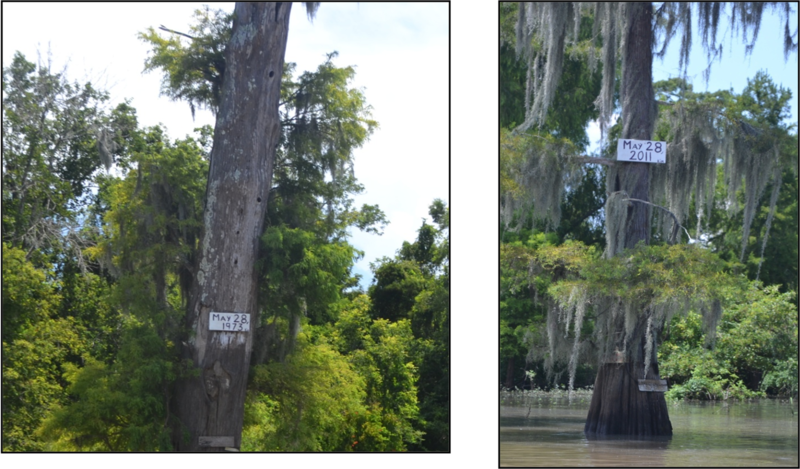 If you travel the Basin from the Bayou Pigeon public boat launch… in the main bayous you've probably noticed this as well. At times, it seems you can see a sign at anytime in your visual line of sight. It makes you wonder, are all these signs really necessary ? 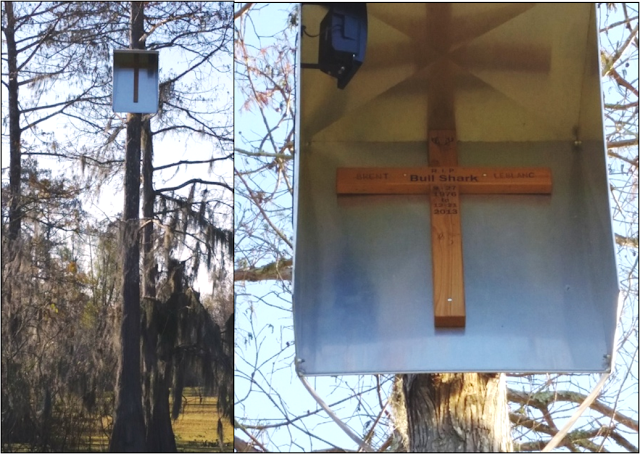 Are they helpful, or do they reduce the visual environment of the Atchafalaya swamp? I’ll let you the readers decide for yourself. 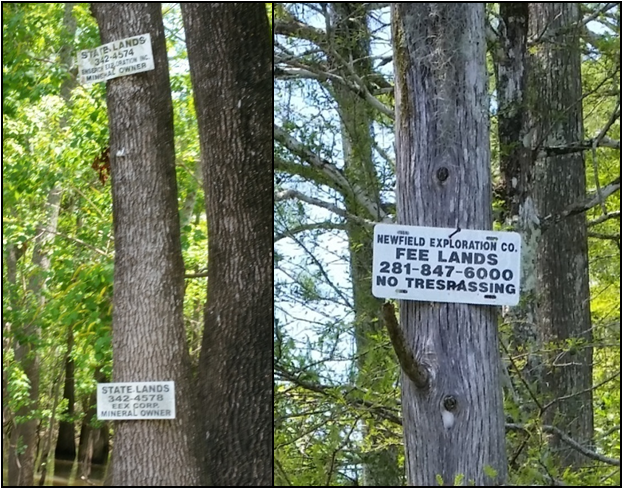 Prior to the 1940’s / 50’s there were just a few signs relative to trespassing and land ownership, in the basin. A tradition of tolerance had developed among the landowners for the Swampers regarding fishing, hunting and trapping. Basically a culture had developed in the early 1900’s that the landowners allowed Swampers to hunt, fish and trap fur wherever they found fish and game . This was primarily because the area was isolated and the Swampers lived on houseboats versus the land and they moved around a lot…, ie. they were not long term Squatters. 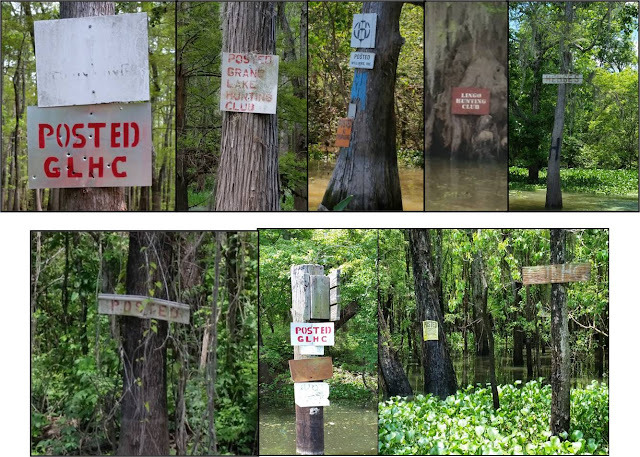 Most Atchafalaya Basin landowners have always had signs stating posted / no trespassing marking their property lines. 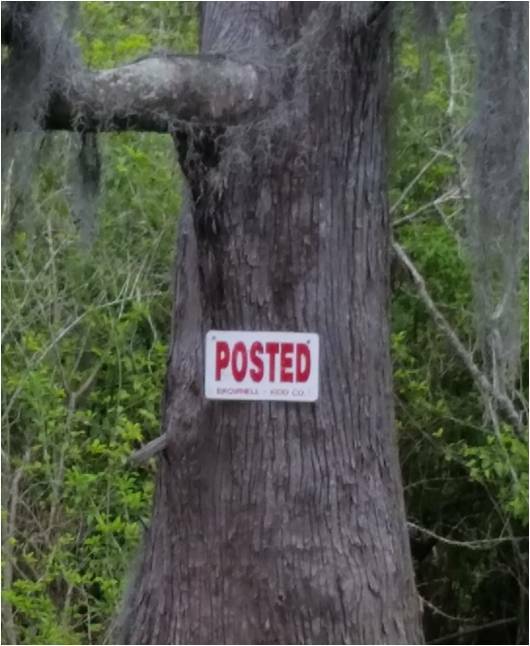 What does the posting of No Trespassing signs accomplish? "Protection from Property Liability“. 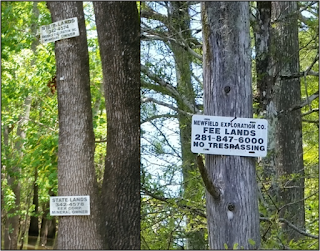 Law Code requires that land owners post conspicuous signs near the primary entry points of the area that are closed to the public. 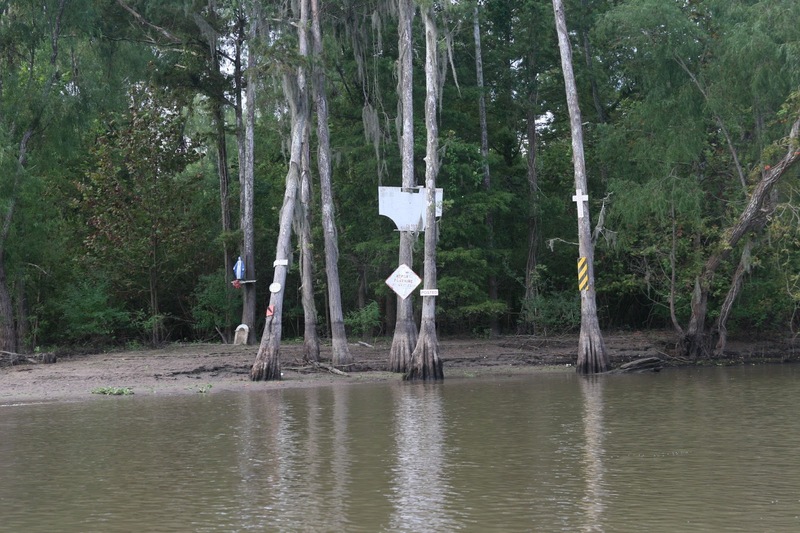 In the Atchafalaya Basin they are typically small and strategically placed. When the signs are high quality and well maintained the landowners credibility / professionalism is enhanced. My experiences are, with Williams Inc. that they are professional and keep their property lines clean, clearly visible and unobtrusive. . Why do I say that? They use small, long lasting metal signs , attached with minimum nails, ( 2, Galvanized), strategically located for long term sustainability. Property corners highlighted by blue paint at the start and show the N/S, E/W direction… of the line. Periodically on heavily traveled Oil & Gas access canals they will have larger signs marking their property line. A name most folks in Atchafalaya Heritage are not familiar with. I don’t understand why, he was listed as one of the 100 Eminent Lumbermen of the United States. Mr. Downman controlled the Jeanerette Lumber & Shingle Company, Limited, at Jeanerette, Louisiana; the Bowie Lumber Company, Limited ; the Des Allemands Lumber Company, The Iberia Cypress Company and the White castle Lumber & Shingle Company. “ He was as well known and prolific ine the Cypress Timber business as F.B. Williams, who was called ‘The Cypress King” of but he was of a lower profile. My experiences with Jeanerette are similar to Williams inc. Their property lines are marked and current. They use small, long lasting metal signs , attached with minimum nails, ( 2, Galvanized), strategically located for long term sustainability. Property corners highlighted by yellow paint at the start and show the N/S, E/W direction… Many Oil & Gas access canals have there names listed as well. The Brownell Land Company is the 21st century legacy of the Brownell family in Louisiana beginning in 1880. The Berwick Lumber Company consisted of a lumber and shingles mill in Berwick City, Louisiana, Charles Horace Brownell, (1865-1934) son of Charles Richard Brownell, managed the latter. Charles Russell Brownell Sr. and his wife, Anna Widmer had one son, Dr. Charles Russell Brownell Jr. Like his father Brownell Jr. Managed family business, while also engaging in a medical practice and politics. He was mayor of Morgan City from 1951 to 1983 and served for the State House of Representatives from 1948 to 1952. The Brownell family is known for participation in philanthropic activities and charities. The company owns land in St. Martin, St. Mary, Terrebonne, Iberia, Assumption, and Iberville Parishes. Is a major landowner in the Atchafalaya Basin. The CEO, Michael Vanover, is the son of Dr. Charles Russell Brownell Jr. and took over when Dr Brownell passed in 1989. My experiences with Brownell Land Co. are very positive. they have strong connections with the 'Folks' in the Atchafalaya Heritage parishes. They view their lessee's as assets and depend on them to be there eyes and ears on the property. Mike Vanover personally makes a once year trip through their entire landholdings. Is the is the descendant of the Kyle Lumber Co which was established in 1866. Kyle Lumber Company consisted of a lumber and shingles mill in Franklin, Louisiana. Today Kyle Peterman manages over 20,000 acres in the Atchafalaya Heritage area. Newman Trowbridge Jr., who died in a scuba diving accident in 2014, was the long time leader of K-P Management from the early 1970's . In my opinion, he was the single most important person in representing Louisiana Atchafalaya Landowners interest in preserving private property and at the same time accommodating a multi use strategy to sustain / preserve the Atchafalaya Basin. Making the Atchafalaya a National Park / Preserve and closing down the land to everyone but hikers and birdwatchers is and was not a popular plan with local folks. Located in Plaquemine, La. has been around since 1848. Today they own thousands of acres of land in 10 Louisiana parishes located in the Atchafalaya heritage area. 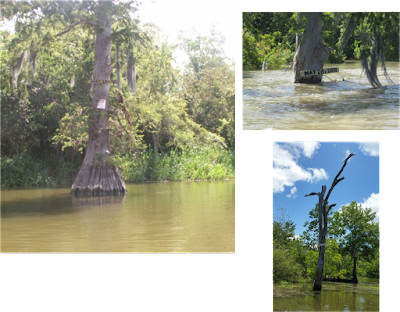 A. wilberts has played a large role in preservation of Atchafalaya Basin wetlands and community projects in Iberville Parish and to the community of Bayou Pigeon, LA. They maintain posted / no trespassing signs on the major bayous. There are many smaller land companies located in the Grand River - Bayou Pigeon vector of the Atchafalaya Floodway. 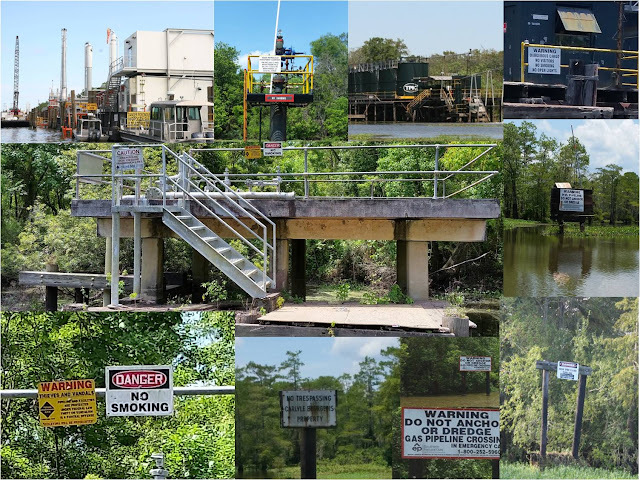 The state of Louisiana owns thousands of acres in the Atchafalaya Floodway as well… The Dow Chemical Co. donated 50,000 acres of land to the state in the 1970's. (the old Schwing Lumber co.) They put signs on their property as well. 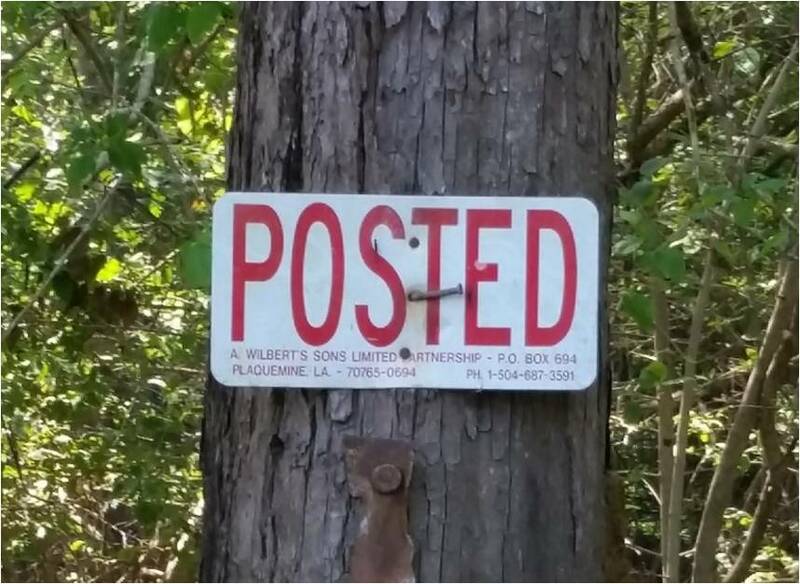 There signs are sometimes questionable because they put up signs on disputed property that are claimed by private landowners as well. Oil & Gas Industry 'Signs"
Starting in the late 1970’s leases for hunting rights began appearing in the Atchafalaya Basin…particularly in the Grand Lake / Bayou Pigeon vector. Tradition and culture since 1900’s had developed, that people hunted, trapped and fished where they wanted. The Landowners tolerated that trespass. Even though the landowners already had property signs hunting Clubs add there own signs. 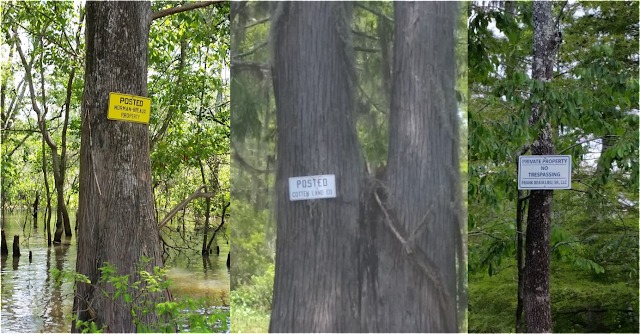 Today it seems every inch bayou frontage is leased… Hunting club signs are everywhere, in some cases it seems every 100 yards … and they are made out of every conceivable type of material… from plywood, 55 gal. drum lids, 5 gal bucket tops, vinyl siding, waterproof coated paper, metal , and corrugated plastic. Posted signs are just like locks,they keep good people honest… not Outlaws. Through Your Intercession Guide all who View, Fish and Hunt , safely through these waters. Protect from Unseen Logs, Stumps, Tree Limbs, Pilings and Outlaws. It seems good to mark and to remember for a little while, the place where a man died. these guys have some creative ability..
Chachie is an avid outdoorsman and sportsman. He is a charter member and the current Chairman of the Board of the Catfish Hunting Club, Inc. of Bayou Pigeon, La., a member of the National Rifle Association and the Boone and Crockett Club of America. He has been hunting and fishing in the Central Atchafalaya Basin since the 1963. 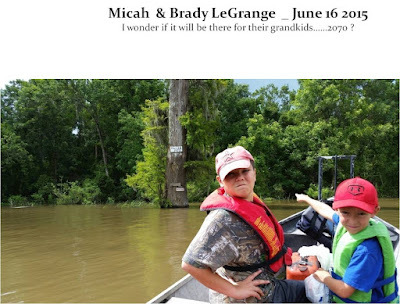 He has been involved with the Atchafalaya Basin Landowners and the LW&F in improving the quality of the hunting and fishing in the basin since the early 1970’s. He is a licensed alligator hunter in the State of Louisiana and, he says, a seriously addicted deer hunter. 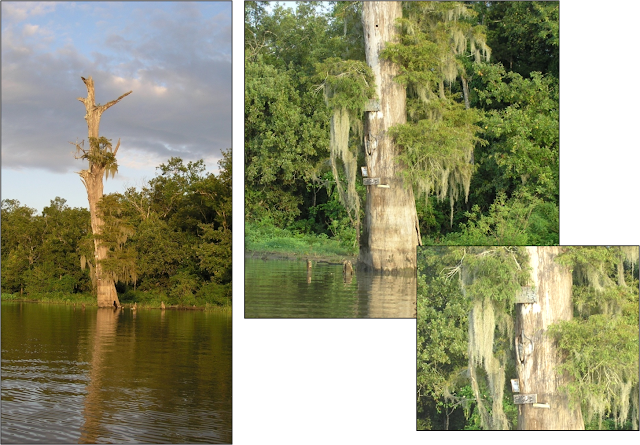 He is the author and publisher of "Bayou Pigeon, LA - Spirit of the Atchafalaya."